Danger!? Tsuchinoko? is a nope for me. Hate snakes. Same effects as the other Danger monsters, so lets get to the good stuff. If your opponent hits Tsuchinoko then you can Special Summon it regardless. Not much of an effect at first, considering all the other monsters either searched or destroyed, but then you remember Link Summoning. Regardless, Tsuchinoko is hitting the field. If you draw because of it, that’s a plus, but the point of Tsuchinoko is to start the Link Summoning without having to use your big boys. This teams up very well with the smaller Danger monsters, using them to set up Extra Monster Zones in your Main Monster Zone area. Get that Wee Witches Apprentice and boom, two more slots for big Xyz or Link Monsters. Because of its Special Summon ability and non-focused Danger effects, Tsuchinoko makes itself a flexible card for any archetype that values monsters in the graveyard. Probably the most versatile reptile is Danger!? Tsuchinoko?, a Level 3 Dark Reptile-type monster with 1300 Atk and 0 Def. The Danger effect is alive and well here, so hopefully you draw a card. The once per turn effect is that this reptile Special Summons itself if the opponent picks it from the first effect’s randomness. That means that no matter how it’s discarded (except cost) it Special Summons itself. That is why it’s the most versatile. There are better options that do the second effect, but in a game where you want to draw or summon big monsters, Tsuchinoko? helps with both. You definitely want this card in your hand when it’s low so you can Special Summon it as a block, material, or whatever. Try it out, the more options the better. The first Danger! monster of this week and it is the cutest one and is likely going to be the cutest one for the rest of the time the archetype exists, Danger!? Tsuchinoko? Tsuchinoko? is a Level 3 DARK Reptile with 1300 ATK and 0 DEF. ATK is pretty low and DEF is non-existent, but I don’t keep my standards high for stats on Level 3 and lower monsters. Reptiles have their own Icarus Attack as well as their own Painful Choice like card and I’m still waiting for something to break that but besides that Reptile isn’t the strongest type, DARK is a great attribute though. Level 3 works with Jackalope? if you want to make some sort of Rank 3 Engine in something like Burning Abyss. Tsuchinoko? has the effect all the other Danger! monster have where you reveal it and then your opponent will randomly select a card in your hand and if they choose a card that isn’t the same as the monster you revealed, you discard that card and Special Summon the Danger! you revealed and draw 1 card, but if your opponent chooses the Danger! monster you chose to reveal, you discard said Danger! I won’t repeat that for the rest of the Danger! monsters this week so I’ll dub it the “Danger! effect” like I did a few months ago for the first wave of support, just know said effect is not a hard once per turn. Each Danger! 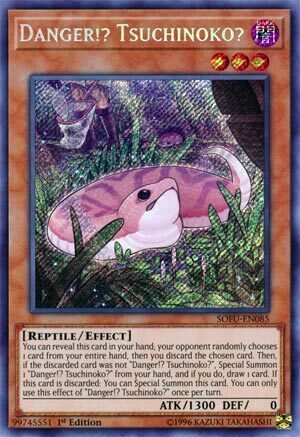 has a discard effect that is a hard once per turn and Tsuchinoko? when discarded will Special Summon itself. So if you reveal Tsuchinoko? you know you are guaranteed to summon it, the only thing not guaranteed is what is discarded and if you’ll draw an extra card or not. Either way, Tsuchinoko? is easily the best card from this wave of Danger! and is worthy of being ran in triplicate. Art: 5/5 That isn’t dangerous, it’s cute… well it maybe poisonous, I dunno. Also as when I chose the first Danger! week not so long ago, I put the little creatures in the early part of the week, and worked our way up to bigger ones. Danger!? Tsuchinoko? is a cute little Snake, and another valuable asset to the Danger! player. Dark is good, Reptile is fine for the player, 1300 attack is GOOD on Level 3, and we see 0 defense here. Anyway, in case you’re not familiar, the Danger! theme is as so, you reveal the Danger! Monster of your choosing from your Hand to your opponent and your opponent then chooses one of said cards. If they choose the Monster you revealed, it goes to the Graveyard, and if not, you Special Summon it to the Field. You’re then awarded to Draw 1 card from the Deck as well. As I referenced yesterday, the theme likes to be discarded as well. Here, despite being a weaker card, when discarded, Tsuchinoki? gets to Special Summon itself to the Field. The fact they all such varying effects, but still grant you a resource in one way or another from the Graveyard as well, only makes the Deck that much more powerful. Knowing any Danger! Monster can be turned into a discard fodder you can +off is a beautiful thing. It’s a smaller piece, but still very useful. Danger! theme is very fast, and can hit you hard if you can’t answer for it.